Running out of time and still want a gift that will wow your family and friends? No need to fret: there are plenty of good last minute gift ideas that you can make yourself. From stationary to succulents, you can find something that works for you; whether it’s a homemade holiday gift, an office thank you or a birthday present. We’re sharing 46 last minute gift ideas that will give you both inspiration and DIY tips. As you decide on your gifts, think about items that’ll be truly appreciated and enjoyed. If you’re looking for last minute gift ideas for her, impress her with a handmade photo frame. 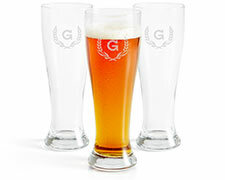 If you’re in need of last minute gift ideas for him, consider personalizing a pilsner glass and pairing with his favorite brew. Create unique bottle stoppers for wine and liquor by wood burning each piece. If you don’t have a wood burning kit, you can paint the stoppers instead. Take a simple cube or planter and personalize it with your friend’s initials. Then, run by your local garden store to pick up a beautiful and low maintenance plant. Add a dash of personality to any kitchen or dining room table. Decorate salt and pepper shakers with simple etched designs. Brush a blank canvas with joyful colors like yellow, pink and blue. Choose an uplifting quote or phrase for a personalized touch. Great for relaxing aching muscles or warming up on a chilly day, make a heating bag for a well-appreciated gift. Place lavender and wheat inside fabric then sew it securely so nothing falls out. Whip up a batch of chocolate or vanilla cupcakes, then top them with special treats like fresh berries and crushed candy bars. 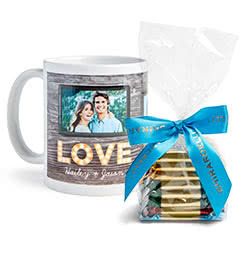 Package them in a gift box for a professional presentation. Everyone can appreciate some gourmet bread fresh from the oven. Stop by their favorite bakery and grab a loaf of something special. Wrap it in a personalized tea towel for a special touch. Form beautiful jewelry dishes out of clay. Line the edges with acrylic paint for a decorative touch. The lucky receiver will have a place to store their earrings, rings and other jewelry. Fashion a pendant that resembles a tree out of wire and beads. Hang it from a chain to create a custom, earthy necklace. Make a set of coasters by crocheting jute twine into small disks. These coasters fit well with other rustic and farmhouse decor. Paint the outside of mason jars to create colorful vases. Fill them with fresh blooms or fabric flowers depending on the season. Who doesn’t love having stationery on-hand for birthdays and anniversaries? Design your own stationery and place the cards and envelopes in a sleek box. Blend two colors of clay together to make a marbled effect. Form candle holders out of the clay and brush them with an enamel finish. Customize a notepad for jotting down memories or writing to-do lists. Design your look on a computer then print the number of pages you want. Floral and herb perfume can be simply made with water and essential oils. Add fresh herbs and flowers to the spray bottle for a fuller scent. Place citrus peels and alcohol in mason jars to make your own extract. Try lemon and orange—both of which are great for baking and cooking. Grab a bottle of red or white wine and your gift is almost complete. Wrap it in a custom wine bag or tea towel then head to the party! The best jewelry gives off a bit of flair and personality. Secure gemstones or rhinestones to earring backs for quirky jewelry your mom or sister will love. Put your artistic abilities to use by painting a canvas with an ocean scene. Blend blues, greens and whites for this dreamy wall decor. Securing an open bottle of wine with a cork helps preserve it for future sips. Glue figurine dogs, cats or rhinos to simple toppers for all of the animal lovers in your life. For the friend that loves being in the kitchen, grab some popular fresh herbs like rosemary and mint and plant them in a simple mason jar. They’ll be able to keep it on their windowsill for easy maintenance. Enhance a set of wooden spoons and spatulas by dipping them in colorful paints. Choose one color for the whole set or mix it up for variety. Whether they’re banana nut or whole bran muffins, these sweet and healthy treats will be appreciated. Package them in a gift box and add a clever tag. Liven up someone’s refrigerator or office with these floral accents. Adhere fabric flowers to small magnets for an easy, yet beautiful last minute gift idea. Line the edges of a corkboard with a patterned fabric like one with polka dots or stripes. Secure a strip of the same fabric to the back of the board to create a hanger for a bedroom door or kitchen wall. Fill a basket with all sorts of fruits: apples, bananas, kiwis and mangos. Some of the most appreciated last minute gift ideas are simple and practical. Have a friend or coworker who loves to write? Make them a personalized journal with a cover that will inspire them. Succulents are both beautiful and easy to maintain. Plant one in a mason jar then add a ribbon for a special touch. Looking for last minute gift ideas for your pet-loving friends? Bake a batch of healthy chew sticks using ingredients you likely already have in your kitchen, like applesauce and cinnamon. Think about the style of the person you’re gifting. If they wear neutral colors, fashion jewelry out of those tones. If they’re more eclectic in their style, bead a bracelet with bright colors. Fancy soaps aren’t just found in boutiques. You can make your own soap stones out of a few simple ingredients. Add essential oils to the mix, like lavender or rose extract, for a relaxing fragrance. Make or buy donuts for one of the most delicious last minute gift ideas. Create a cute tag to secure to your gift bag or box. Wrap a piece of fabric or tea towel around a glass vase. Tie twine or string around the center to hold it in place. Don’t forget to add fresh blooms like lillies or tulips. With a marker and blank note cards, you can create cute, classy stationery. Try the dalmatian look or go for simple polka dots. Sew custom pillow covers for a friend’s living room or bedroom. Choose neutral fabrics or ones you know will match their decor perfectly. Pack all of the sundae essentials into a box: chocolate syrup, peanuts, candy and cones. Any family member or friend will love receiving this tasty kit! Repurpose a pair of bright socks to make a fun dog toy. Your human and canine friends alike will appreciate such a playful gift. Homemade extract is a delicious addition to any baking recipe. Place mint leaves and alcohol in a mason jar to create your own. Layer the ingredients for chocolate chip or oatmeal raisin cookies into a mason jar. Write the baking instructions on a note card and attach it to the lid. Beautiful, dangling earrings aren’t hard to make. With only a few supplies, you can create several sets in a matter of minutes. Clip images from a newspaper or comic book to make superhero magnets. Include a mix of action shots and conversation bubbles. Stir together the ingredients for an all-natural chapstick: beeswax, shea butter and coconut oil. Add a flavor like mint for a yummy accent. Need last minute gift ideas for him or her? Create a set of coupons for date nights, massages and taking on extra chores around the house. String yarn pom poms on a necklace chain. Your chic homemade jewelry can be worn by mom, grandma, sister or best friend. Start with memory wire and an arrangement of beads to form your own bracelets. Design your beading pattern ahead of time to end up with professional-looking jewelry. Personalize coasters using tiles as your foundation. Adhere scrapbook paper—whether it’s floral or rustic themed—for unique decor that can be used in the kitchen or dining room. Don’t forget that the best gifts are both practical and personalized. If you’re still unsure of a last minute gift, try a custom cutting board or a canvas tote bag. Whatever gift you pick, you’ll have the peace of mind that they’ll appreciate the thoughtfulness.